Please read this (long) introduction, to avoid any misunderstanding as to why and how we are presenting this at this critical time in history. Before we begin this very controversial discussion, I would like to remind us all, there are people out there who are so steeped in problems of this world, they may be ready to do just about anything, even take their own lives (God forbid); there are many people who only have their faith to hang on to, and little else to keep them going. It is our ardent desire and total commitment to bring about a better understanding for the believers in these most difficult of times for those who adhere to the belief in the God of Abraham, the God of Moses, God of David, God of Solomon, God of Jesus Christ and the same God of Muhammad, peace be upon them all. But how is this to be done when there exists such animosity and conflict between Christians, Jews and Muslims living in today's world? That is the big question. Certainly, opening a door of textual criticism against the English translation of the King James Bible (KJV), would seem most counter productive for our purpose of finding and maintaining common ground. Yet it is this very subject, we feel will bring us to a much needed summit for understanding and sharing the good news of worship of the Creator and not worship of His creation. Consider the Bible in English for just a moment. We know without debate, the Bible was not revealed in the English language. For that matter, we know the Old Testament of Bible was revealed in Hebrew and the New Testament in Aramaic (some believe it was simultaneously translated into Koine Greek at the time of Jesus, peace be upon him). Additionally, we know there is not a single original, nor copy of a copy of anything original on the planet, nor has there been for more than a millennium. This has not stopped Christians from believing in the teachings (at least most of the teachings) contained in the Holy Book of Christianity, nor is it desired that this discussion might cause anyone to loose faith altogether. We are looking for a common ground to bring us closer to understanding the beliefs of the early Christians as well as the beliefs of the early Muslims. It is hoped that in this way, both the two largest religions on earth may find benefit from critical observations and open discussions for solutions for working together to build a better future, rather than continue on a road to sure misery and destruction for all of us. That being said at the outset of this discussion, we recognize Christian scholars tell us as a matter of fact, that the original autographs of the New Testament do not exist (Comfort, 1990, p. 4). Additionally, these scholars state as a fact that only copies of copies of copies of the original documents have survived (see: Bart Ehram - below). And we recognize there will always have those who are disposed in an endeavor to expose these facts in hopes of making a name for themselves, or at least getting their opinions heard. Again I say, it is not, I repeat: NOT - our purpose herein to cause anyone to doubt in the existence of God or to leave the faith in God, His Books, His angels or His messengers. Quite the opposite is true. It is our desire to closely examine and better understand a more reliable source with more understandable interpretations and more logical methods for implementing true faith in that same God, with emphasis on developing higher respect and better working relations between people everywhere. Let us begin with what Muslims believe about God (Allah). He is One without partners and the only unforgiveable sin, is the sin of breaking the First Commandment - "Thou shalt have no other gods besides Me (Almighty God)." After that the belief in angels: They are created by God Almighty (Allah) from light and they always do his bidding and never refuse to obey. (In Islam the 'devil' is not a 'fallen angel' - he is from a type of creation called 'jinn' and made from a 'smokeless fire' rather than light like the angels. Lucifer (Arabic: Iblees) was given free choice and misused it to worship himself instead of God Almighty). And now the topic of this discussion (at long last) - REVELATIONS (scriptures: Torah, Psalms, Gospels, Quran). Quran (Recitation of God's Speech to mankind): Each and every word of the Quran in Arabic is believed to be the actual and literal word of God Almighty (Allah). You may have heard this before and wondered how over one and half billion people (88% of whom do not even speak Arabic) would have such a strong commitment to this belief. However, did you know, Muslims are told in the Quran itself, it is a condition of belief for each and every Muslim to believe in the original scriptures as sent to all of God's prophets of old? No joke. This is the third pillar of belief in the 6 articles of iman (belief) in Islam. But what exactly do the Biblical scholars say about today's versions of the Bible in various forms and languages? Ancient Bible scholars as well as modern day experts have proven again and again, the Bible we know today, especially in English, has been corrupted, long before it was translated to English ~ Long Ago many different endings were added to the book of Mark - chapter 16, verse 8 was the last verse in oldest manuscripts. NOTE: The Last Testament of God (Quran) has never suffered such human intervention. FACT: Mark 16:9-20 is not in any of the original manuscripts of Mark. It only contained eight (8) verses. Versions of later dates contain different numbers of verses and contain very different meanings. These are all deemed to be later additions to the Gospel of Mark by most New Testament scholars in the past century. The main reason for doubting the authenticity of the ending is that it does not appear in the oldest existing witnesses, and it is absent from others in ancient times by early writers of the Church. Moreover, the ending has some stylistic features which also suggest that it came from other hands. The dedicated Christians who cannot accept a Gospel without the resurrection therefore, make the claim that the Gospel is obviously incomplete without these verses. So then they go on to claim, at least a few scholars believe that the final leaf of the original manuscript was lost (but there is no evidence for this statement, not from ancient testimony or writings. Seems someone would notice something like that missing, you know? Also it is certain the ending appearing in English versions today (verses 9-20) was supplied much later perhaps during or after the second century. Below are some excerpts from various scholarly sources that conclude that the verses must be a later addition, but somehow this is acceptable. Read . .
One thing may be observed, that this Gospel has suffered more by the carelessness and inaccuracy of transcribers than any of the others: and hence the various readings in the MSS. are much more numerous, in proportion, than in the other evangelists. Every thing of this description, which I judged to be of real importance, I have carefully noted. Westminster Study Edition of Holy Bible (Philadelphia: Westminster Press, 1948) Mark Chapter 16, Verses 9-20. This section is a later addition; the original ending of Mark appears to have been lost. The best and oldest manuscripts of Mark end with ch. 16:8. Two endings were added very early. The shorter reads: "But they reported briefly to those with Peter all that had been commanded them. And afterward Jesus himself sent out through them from the East even to the West the sacred and incorruptible message of eternal salvation." The longer addition appears in English Bibles; its origin is uncertain; a medieval source ascribes it to an elder Ariston (Aristion), perhaps the man whom Papias (c. A.D. 135) calls a disciple of the Lord. It is drawn for the most part from Luke, chapter 24, and from John, chapter 20; there is a possibility that verse 15 may come from Matthew 28:18-20. It is believed that the original ending must have contained an account of the risen Christ's meeting with the disciples in Galilee (chs. 14:28; 16:7). 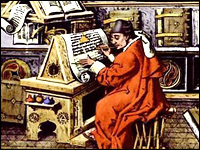 Readers please note: The vast majority of all Biblical scholars say Gospel of St. Mark is the OLDEST of the manuscripts of any of the gospels. So how could it be that Mark be drawn from any of the other gospels, specially being much older than Luke, or Matthew, or John (earliest records indicate the Gospel of St. John to be written about 90 A.D., long after any of the other gospels)? Sorry for the interruption. Continue . .
A Commentary on the Holy Bible, edited by J.R. Dummelow (New York: MacMillan, 1927), pages 732-33. 9-20. Conclusion of the Gospel. Internal evidence points definitely to the conclusion that the last twelve verses are not by St. Mark. (1) the true conclusion certainly contained a Galilean appearance (Mark 16:7, cp. 14:28), and this does not. (2) The style is that of a bare catalogue of facts, and quite unlike St. Mark's usual wealth of graphic detail. (3) The section contains numerous words and expressions never used by St. Mark. (4) Mark 16:9 makes an abrupt fresh start, and is not continuous with the preceding narrative. (5) Mary Magdalene is spoken of (16:9) as if she had not been mentioned before, although she has just been alluded to twice (15:47, 16:1). (6) The section seems to represent not a primary tradition, such as Peter's, but quite a secondary one, and in particular to be dependent upon the conclusion of St. Matthew, and upon Luke 24:23. Readers note again: Verse 8 gives clear instruction from Jesus (peace be upon him) to those in front of him; "Go forth and tell no one". Yet, the very next verse (depending on which version you like) at least the one referred to above - says "And they reported all things that had been commanded them briefly (or immediately) to the companions of Peter". How's that for violating the very last thing they were ordered not to do? Kinda makes you wonder at the next sentence where it refers to the "holy and incorruptible preaching of eternal salvation"
Sorry again, for another interruption but this was too much to pass by. Keep reading . . Readers note (one more time): It immediately tries to claim this is no casual or unauthorised addition to the Gospel. How is that? Does that mean there could be acceptable "additions" to the Gospel? Then note it refers to manuscripts written almost 200 years after the earlier ones found more recently, and tries to make it seem as though, because there are so many manuscripts, versions and other authorities (nearly all of them similar to each other), it thus somehow forms an integral part of the Gospel - it can be shown to have existed? (at least it shows that it exisited!). Another note: 'sub-apostolic age' means: the time period after all of the companions of the companions of Jesus (peace be upon him). This is because Paul is considered an 'Apostle' and he was not a companion of Jesus (peace be upon him). Rather, he was a companion of a few companions of Jesus (peace be upon him). Bart Ehrman explains how scribes - through omission & intention - they changed their Bible..
Ehrman says the modern Bible was shaped by mistakes and intentional alterations that were made by early scribes who copied the texts. In the introduction to Misquoting Jesus, Ehrman writes that when he came to understand this process 30 years ago, it shifted his way of thinking about the Bible. He had been raised as an Evangelical Christian. Ehrman is also the author of Lost Christianities: The Battle for Scripture and the Faiths We Never Knew, which chronicles the period before Christianity as we know it, when conflicting ideas about the religion were fighting for prominence in the second and third centuries. The chairman of the religious studies department at the University of North Carolina in Chapel Hill, Ehrman also edited a collection of the early non-canonical texts from the first centuries after Christ, called Lost Scriptures: Books that Did Not Make It into the New Testament. To discuss the copies of the New Testament that we have, we need to start at the very beginning with one of the unusual features of Christianity in the Greco-Roman world: its bookish character. In fact, to make sense of this feature of Christianity, we need to start before the beginnings of Christianity with the religion from which Christianity sprang, Judaism. For the bookishness of Christianity was in some sense anticipated and foreshadowed by Judaism, which was the first "religion of the book" in Western civilization. The Judaism from which Christianity sprang was an unusual religion in the Roman world, although by no means unique. Like adherents of any of the other (hundreds of ) religions in the Mediterranean area, Jews acknowledged the existence of a divine realm populated by superhuman beings (angels, archangels, principalities, powers); they subscribed to the worship of a deity through sacrifices of animals and other food products; they maintained that there was a special holy place where this divine being dwelt here on earth (the Temple in Jerusalem), and it was there that these sacrifices were to be made. They prayed to this God for communal and personal needs. They told stories about how this God had interacted with human beings in the past, and they anticipated his help for human beings in the present. In all these ways, Judaism was "familiar" to the worshipers of other gods in the empire. In some ways, though, Judaism was distinctive. All other religions in the empire were polytheistic -- acknowledging and worshiping many gods of all sorts and functions: great gods of the state, lesser gods of various locales, gods who oversaw different aspects of human birth, life, and death. Judaism, on the other hand, was monotheistic; Jews insisted on worshiping only the one God of their ancestors, the God who, they maintained, had created this world, controlled this world, and alone provided what was needed for his people. According to Jewish tradition, this one all-powerful God had called Israel to be his special people and had promised to protect and defend them in exchange for their absolute devotion to him and him alone. The Jewish people, it was believed, had a "covenant" with this God, an agreement that they would be uniquely his as he was uniquely theirs. Only this one God was to be worshiped and obeyed; so, too, there was only one Temple, unlike in the polytheistic religions of the day in which, for example, there could be any number of temples to a god like Zeus. To be sure, Jews could worship God anywhere they lived, but they could perform their religious obligations of sacrifice to God only at the Temple in Jerusalem. In other places, though, they could gather together in "synagogues" for prayer and to discuss the ancestral traditions at the heart of their religion. These traditions involved both stories about God's interaction with the ancestors of the people of Israel -- the patriarchs and matriarchs of the faith, as it were: Abraham, Sarah, Isaac, Rachel, Jacob, Rebecca, Joseph, Moses, David, and so on -- and detailed instructions concerning how this people was to worship and live. One of the things that made Judaism unique among the religions of the Roman Empire was that these instructions, along with the other ancestral traditions, were written down in sacred books. For modern people intimately familiar with any of the major contemporary Western religions (Judaism, Christianity, Islam), it may be hard to imagine, but books played virtually no role in the polytheistic religions of the ancient Western world. These religions were almost exclusively concerned with honoring the gods through ritual acts of sacrifice. There were no doctrines to be learned, as explained in books, and almost no ethical principles to be followed, as laid out in books. This is not to say that adherents of the various polytheistic religions had no beliefs about their gods or that they had no ethics, but beliefs and ethics -- strange as this sounds to modern ears -- played almost no role in religion per se. These were instead matters of personal philosophy, and philosophies, of course, could be bookish. Since ancient religions themselves did not require any particular sets of "right doctrines" or, for the most part, "ethical codes," books played almost no role in them. Judaism was unique in that it stressed its ancestral traditions, customs, and laws, and maintained that these had been recorded in sacred books, which had the status, therefore, of "scripture" for the Jewish people. During the period of our concern -- the first century of the common era, when the books of the New Testament were being written -- Jews scattered throughout the Roman Empire understood in particular that God had given direction to his people in the writings of Moses, referred to collectively as the Torah, which literally means something like "law" or "guidance." The Torah consists of five books, sometimes called the Pentateuch (the "five scrolls"), the beginning of the Jewish Bible (the Christian Old Testament): Genesis, Exodus, Leviticus, Numbers, and Deuteronomy. Here one finds accounts of the creation of the world, the calling of Israel to be God's people, the stories of Israel's patriarchs and matriarchs and God's involvement with them, and most important (and most extensive), the laws that God gave Moses indicating how his people were to worship him and behave toward one another in community together. These were sacred laws, to be learned, discussed, and followed -- and they were written in a set of books. Jews had other books that were important for their religious lives together as well, for example, books of prophets (such as Isaiah, Jeremiah, and Amos), and poems (Psalms), and history (such as Joshua and Samuel). Eventually, some time after Christianity began, a group of these Hebrew books -- twenty-two of them altogether -- came to be regarded as a sacred canon of scripture, the Jewish Bible of today, accepted by Christians as the first part of the Christian canon, the "Old Testament." Please do come to our sites, visit with us and leave your comments. Obviously we will only print the positive and encouraging statements. After all, we can go anywhere on the Internet (or any media) today to find discord, negativity and hatred. We are looking for solutions - Productive, Meaningful and Peaceful Solutions. CHATISLAM IS REALLY NICE NOW. THIS LOOKS GOOD AND MAKDE ME FEEL GOOD TO SEE & USE TO IT.